So many great resources are available to KDP members that it might be a little overwhelming. However, we now offer a way for you to tell KDP what you want! 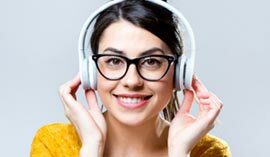 Your MyKDP profile allows you to indicate and change your interest areas and your expertise, and specify what you want from your membership experience. Here are the top five reasons why updating your preferences will help you. 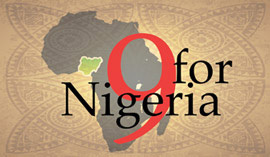 5) Tailor communications for you. By indicating your interests, we are sure to alert you to new resources, issues, and events that fit what you want to know about. 4) Connect with other members who have similar interests. These interests will help unite you with those who have similar issues, questions, or concerns around the topic. This way, you can communicate and learn from one another. 3) Reduce irrelevant emails. Get messages which provide content that addresses the topics most important to you. 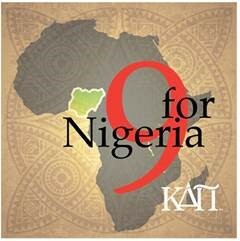 2) Help KDP create resources for your needs. By learning what your interests are, KDP can focus our efforts on resources, benefits, and services that you need to succeed. 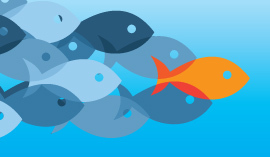 1) Ensure you are getting the most from your membership. We want you to succeed, and the best way to help is by providing you with relevant resources for your needs—no matter where you are in your career. To do this, we need your feedback on how we can best support you. Log in to MyKDP and click on My Education and Interests and My Expectations from Membership to edit your information. Select your choices and save. It’s that easy! 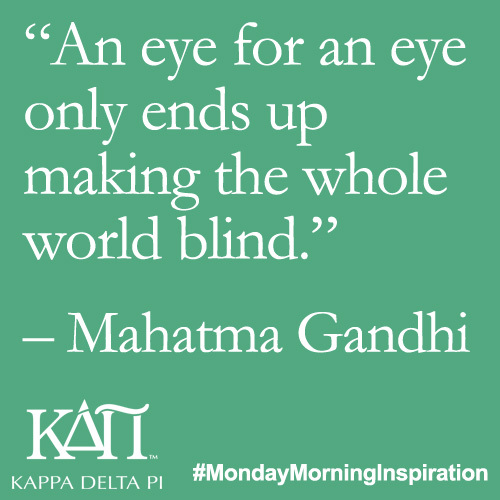 Thanks for being a member of Kappa Delta Pi! 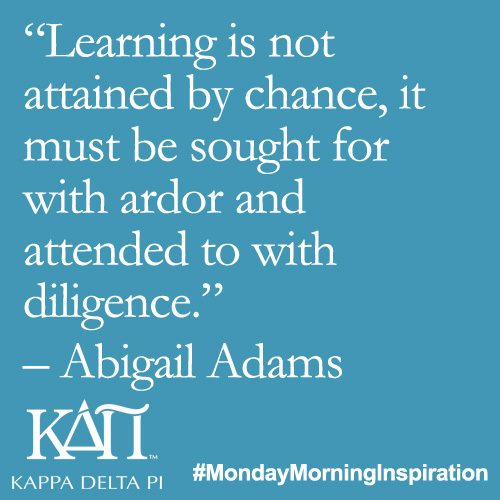 #MondayMorningInspiration: “Learning is not attained by chance, it must be sought for with ardor and attended to with diligence” – Abigail Adams. Check it out and share it on Facebook, Twitter, & Instagram. 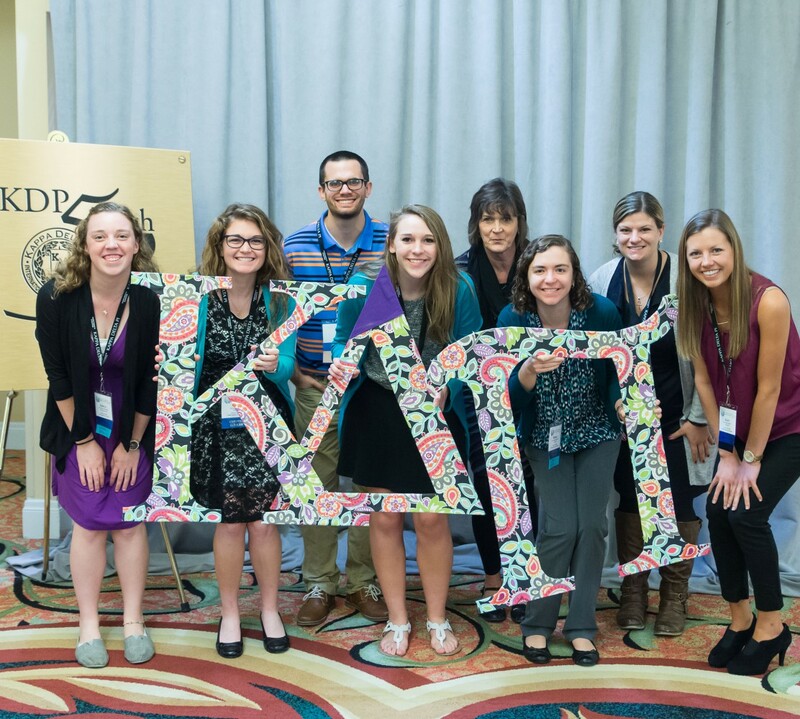 This Friday is the last chance to register for #KDPconvo15! 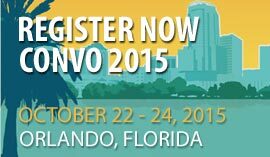 You don’t want to miss this exciting event in beautiful Orlando, FL. The climate crisis is the paramount issue of our time. This Wednesday at 4:00 p.m. (Eastern), learn about how to engage students of all ages in stewardship behaviors, civics, and projects regarding reduction of plastics, gardening, and the use of visual arts. FREE Educational Forum article available this month: “A Safer Place? 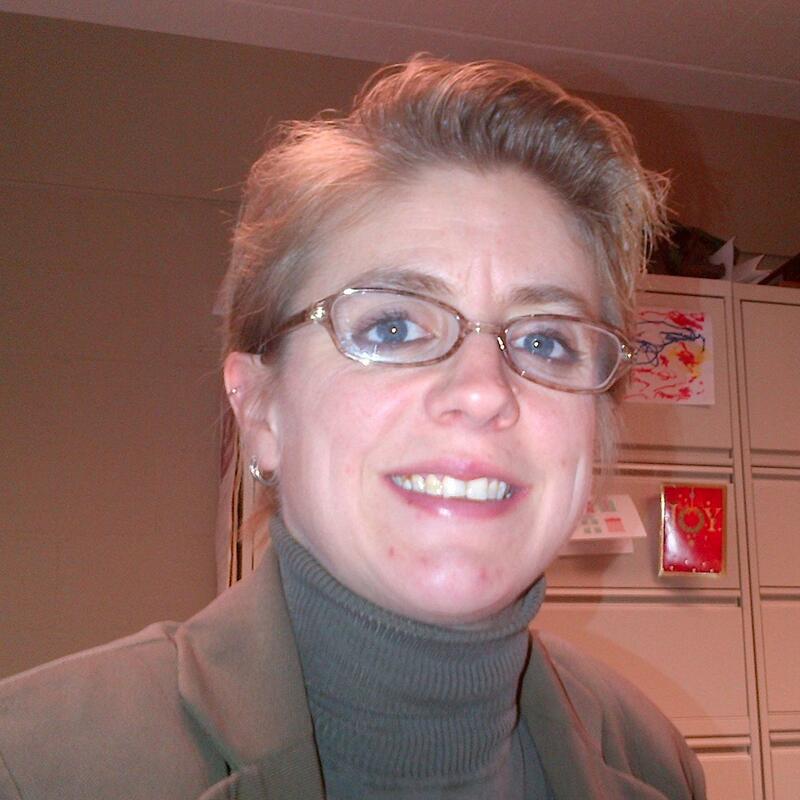 LGBT Educators, School Climate, and Implications for Administrators” by Dr. Tiffany Wright. 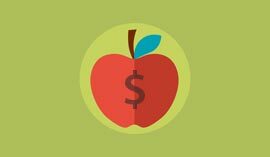 Apply for one of KDP’s 50 – $150 Classroom Teacher Grants before October ends. 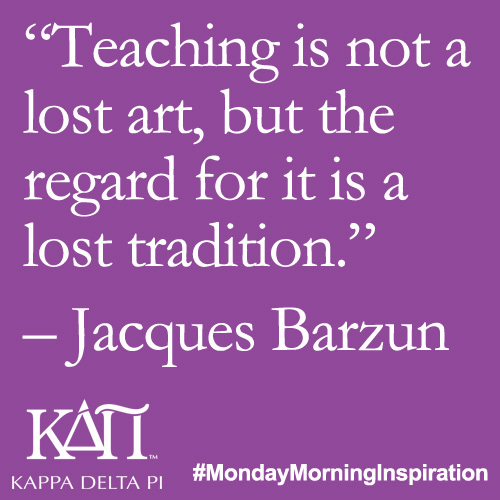 #MondayMorningInspiration: “Teaching is not a lost art, but the regard for it is a lost tradition.” – Jacques Barzun. Check it out and share it on Facebook, Twitter, & Instagram. As October approaches, check out “Halloween Resources to Use in Your Class” on KDP Global, shared by staffer Sally Rushmore. Convocation 2015 is just a little over a month away! Be sure to register before October 9th and pre-order your t-shirt, too. 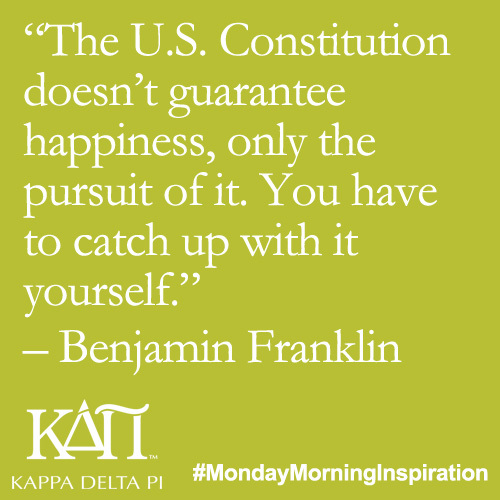 In the United States, it’s Constitution Day, so our #MondayMorningInspiration has a specific theme. Check it out and share it on Facebook, Twitter, & Instagram. 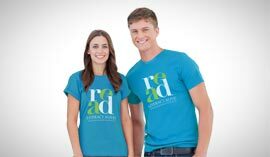 The new, re-designed KDP Store is officially live and ready for your orders. We have some fantastic new products that we think you’ll love! On Thursday, Dr. Beth Wilkins, International President of Kappa Delta Pi, along with longtime member and Chapter Counselor, Dr. Nathan Bond, and Executive Director, Faye Snodgress, will present a webinar on “How to Become an International Kappa Delta Pi Leader”. 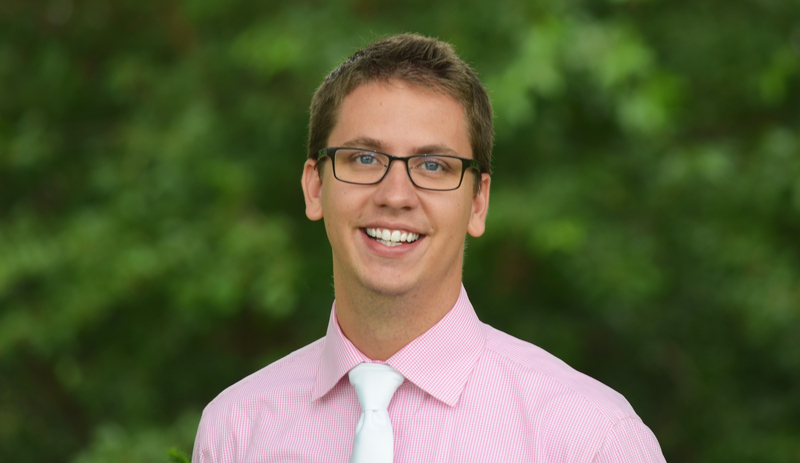 Apply for one of KDP’s 50 – $150 Classroom Teacher Grants!